Gwen Buck, Policy Advisor at the Green Alliance, found her career after becoming interested in the politics around the environment and conservation. She found that involving herself in events and networking opportunities in the local area enabled her to find out about companies and career opportunities she might not have found otherwise. Clare Pugh, Senior Ecologist at Atkins, also recommended joining the Ecology Network as another way to broaden understanding of the industry and access contacts and career opportunities. Both panellists were keen to point out that even though experience might not be in the form of a formal work placement any experience can still be greatly beneficial. David Kirby, Associate Ecologist at WPS, finally added that “gaining any kind of experience is a good idea”. This can be particularly useful in gaining practical experiences such as surveying and gaining a surveying license; these are necessities of the roles at his firm and can be gained whilst still a student. Jonathan Brauner, Logistics and Business Liaison at Wildlife for All, was keen to stress the importance of a positive attitude when working in this area. “All of the staff at our organisation are voluntary” he stated. “This means that it is vital that anyone looking to work with us has the right attitude, both in giving their time and their approach to the work”. Gaining work experience in the industry can often be temporary, unpaid or physically exerting and therefore anyone looking to participate should be positive they are willing to take part and happy to do a range of tasks. Francesca Trotman is the Founder of charity Love The Oceans and was keen to point out that persistence has been a key trait which her career has benefitted from. “I always knew what I wanted to do but setting up a charity which works in Mozambique has plenty of challenges”, she said, “but I’ve been told I won’t be able to do something 1,000 times and have always managed to do them so far”. She also felt that being flexible is a real benefit, particularly due to the atypical types of opportunity that come up to someone looking to work in the industry. The panel were asked about potential growth areas which students may see increased opportunity in for the near future. Clare discussed areas within her work in sustainability for large consultancies and pinpointed biodiversity net-gain (improving biodiversity rather than simply offsetting losses) as an area that is being increasingly promoted within her field. David added that there are increases in the use of new technologies, for example in the collection and analysis of data, which is also growing and is an area which students should look to understand and develop new skills in. The speakers shared their wealth of experience and had plenty of advice for current students about what you can do now to get your career on track. Julia spoke of the importance of knowing your values as this is crucial to researching what type of company you may decide to work for and their values. Julia then spoke of great work opportunities for young and old at Wilmot Dixon. Knowing your values and what you believe in is a good first step. Jon agreed with this and suggested that students spend time researching various types of companies to see which ones fit best. Make use of all possibilities and any connections that you may have. Anastasios added that it is important to be honest and care about what you are doing as this will come across in any interview. Julia loves working within the community and likes the thought of leaving legacy. Businesses may compete, but companies work together as they believe in sustainability. This sector attracts people who want to do the right thing. Julia is an advocate of change and informed students that 95% of decisions are made automatically and this provides a big challenge when trying to implement sustainability. Julia spoke about being resilient and discussed the fact that students may have knock backs when going through the interview process. Growing soft skills such communication and adding experience through volunteering will help. Knowing yourself and your passion will make you stand out. Ali strongly recommended making use of your time outside studying by researching what types of companies that you may want to work for and networking at events and or social media such as LinkedIn. Ali reported that her job as assistant sustainability manager for MACE has been very varied and interesting. Making sure that students have or work on good communication skills is key as client management is a transferable skill that many students may find themselves needing. Nerissa spoke about her job being very rewarding and challenging. Working with clients the communication can be challenging but that it is very rewarding seeing the finished product. Julia spoke about the field of construction are struggling to recruit at this time, suggested that students visit the website and do some research to see if Wilmot Dixon is of interest. Julia also suggested Future Build. This is a big conference running for three days at Excel in London. There are free workshops, product management and sustainability. A good opportunity to do some research. Jon spoke about the need to seize all opportunities presented, you never know what opportunities may present themselves. The panel agreed that networking using social media such as LinkedIn has opened up many doors for students, many opportunities. We’re hosting a week of events to help you navigate the Life and Health Sciences Sector, and find out where you might fit within it. What is the Life and Health Sciences Sector? Well, it encompasses anything that aligns with Life and Health Sciences. That means it’s very wide-reaching – from drug development, patenting, marketing, and selling new therapies, to using interventions directly with patients, or communicating the latest developments in health science to policymakers and the public. That’s why we have four exciting panels lined up for you, where you can hear from people working in a variety of roles within the NHS, private companies, charities, and universities. 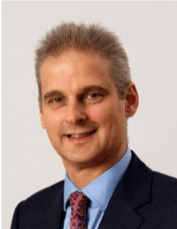 What will I learn from guest speakers? How will I know if I’ll like a particular job? Hearing first-hand accounts from people working in different roles can give you a clue as to whether you’ll like a job. But there’s no substitute for giving it a try yourself. And gaining experience helps you develop new skills, and tells future employers you’re clearly motivated. What does consultancy work involve? Like many things in life, the answer is “it depends”! …on the company you work for, the sector you work in and the specific clients you are engaged by. Resilience is key. People in consultancy businesses work under continuous pressure. There is the pressure to deliver excellent work for a customer to time and budget. They also need to win the next piece of work and respond to the demands of working in and across teams. So, consultancy work is tough, but it can be tremendously rewarding. Communication skills are critical. Even at the most junior level, you will be in a project team, likely to be talking to clients and will get exposure to senior management, so the ability to articulate what you are doing in an engaging and compelling way is key. Contribution to the Team is paramount – that might be a small project team, a business area or the company as a whole. Work is very fluid in consultancies, and people are expected to get involved when there is a need and where they can add something. Variety is energising – if you have an enquiring mind and like doing new things regularly, then consultancy can be really exciting. Projects tend to be from a couple of weeks to 6 months so you will be moving swiftly from one project to another. And, you will often need to juggle multiple projects. We recently completed a knowledge transfer energy project in Bangladesh. As a result, the power sector leaders and experts will be able to maximise access to electricity for the 165 million people in Bangladesh. We looked at how to improve the management of surface water run-off treatment options for Southampton Airport (including a lot of chemicals used to de-ice planes). As a result, we have protected aquatic wildlife by preventing chemicals going into the local river. What sectors does your company provide consultancy for? Can you give some examples of the issues and projects that a sustainability consultancy tackles? At Ricardo, we work across most of the environmental areas: climate change, energy, waste, scarce resources, water, air quality, sustainable transport, agriculture, biodiversity, environmental impact, chemicals. Our clients are many and various – national and local governments, major corporations and heavy industry, transportation providers, infrastructure and utility companies, international agencies and funders (eg the World Bank). But also smaller companies and not-for-profits. This project entailed creation of a charge-point roll-out strategy for EV charging infrastructure in Brighton. A critical element was use of smart grid technology to unlock spare capacity for increased numbers of electric vehicles (automated transfer of electricity to areas of high demand). Through this we were able to maximise the power available from existing infrastructure, hence avoiding costly network reinforcement or substation replacement. This project looked at the implications of transition to a Circular Economy (designing waste out of the economy) across eight key sectors, identifying global trends and potential local action. This brought together key experts from the fields of waste, water, sustainable transport, energy efficiency, resource use and advanced manufacturing. The project provided global insight into actions and best practice activities from across the key sectors, identifying potential implications, barriers and enablers of a circular economy. What range of skills and what academic subjects does your company look for when hiring for consultancy roles? So, we have some very specialist and deep technical skill requirements, some more broad research and investigation skills, + more generic areas like economics, IT, finance and marketing. Therefore, the range of academic subjects we recruit from is wide, and role dependent. Most people we take on will be at Masters level, and many will have a scientific or engineering background, but not all. What are the challenges for the environmental sector in future, and what impact will they have on consultancy work? That is a huge question! I am going to cheat by providing a link to an excellent slideshow that you can look at, recently produced by the World Resources Institute. Tumultuous times: will geopolitics limit climate action? 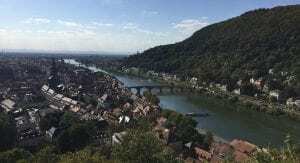 Bracing for impacts: will climate adaptation rise up the agenda? Sustainable apparel: will fast fashion slow down? Deforestation: will commodity supply chains rise to the challenge? Project of the century: will Belt & Road advance green growth? Micro-mobility: a fad or the future? US Climate action: turning the tide on Trump? Global emissions are rising……1.5 degrees temperature rise is not far away…..might be more about adapting to than mitigating climate change in the future? Focus on cities/states as clients (and key actors)……when historically it may have been national governments. Need for more attention on water management (eg enormous water footprint of fashion industry – 2,700 litres for one shirt). China’s “Belt and Road” initiative is huge – opportunities for consultancy (and risks to environment)? Biodiversity expertise needed in response to deforestation. Changes to urban mobility strategies and plans in response to behaviour change. Need for “blended” solutions of public and private finance across all areas. This agenda appears to provide an enormous range of potential opportunities…….and it does. However, there is a but………as a consultant, you can only do the work that clients want to engage you for, and global risks can take time to feed into consultancy projects. In environmental consultancy, the topics are fascinating, challenging, enlightening and rewarding, but you need someone who has a budget to engage you to do the work. So “thought leadership” in helping the wider world to appreciate the issues and the opportunities is key to open the conversations with potential clients. The ideal approach is to seed ideas, get their interest and then offer a solution……that is the art of being a great consultant. Going to a panel or alumni event will give you the opportunity to meet and hear from a range of speakers. They will be able to provide insight into their industries, and stories from their own careers that might prove to be invaluable when starting your own career. To get the most out of attending a panel or alumni event, we’ve got a few tips to help you before, during and after the event. Research the speakers and their organisations. There’s plenty of easy ways to find out about companies and their opportunities, as well as the speakers themselves. Start with LinkedIn to find out about the speakers and the organisations. On LinkedIn, there’s also a fantastic feature attached to organisations that shows you which alumni from UCL work there. It should prove useful to see which UCL graduates work for the organisation, as well as their roles. You might also be surprised to see the wide range of degree backgrounds that our graduates have within a single organisation! There’s also Glassdoor, a helpful resource for finding reviews as well as other information such as salaries and even past interview questions. Lastly, do a search on Google and look through the news to see what has recently been written about the companies in relevant news feeds. If you’ll be attending an alumni networking event, consider what you wear to event to help you make a great first impression. Take notes during a panel event, whether it’s simply to keep a list of websites or events that speakers recommend, or advice that you’ve found insightful. This may also assist with asking questions, as you might want to follow up with questions on something that was said during the event. At an alumni event, try to engage in a conversation with an alum. A simple tip is to ask open questions to begin with such as “How did you start working for …”, as this cannot be answered with a short yes or no, and that will help your conversation start flowing quickly. For any type of event where you can network, always try to connect with people that you are interested in speaking with. Sometimes the connection will be the start of a longer conversation and potentially lead to future opportunities. Within the first couple of days after the event, reach out to your new connections via LinkedIn or email. If they’re a working professional, remember that their time may be limited so be considerate when asking for advice. What are your next steps? Is there a new jobs board to sign up to, or a networking event worth signing up for? Aim to have two or three simple actions that you plan on following up and set a simple deadline for each action. As great as a panel or networking event is, the true value often comes once you capitalise on what you have learnt through the event. Want to attend an exciting panel or networking event? 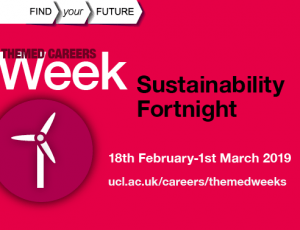 The UCL Careers Themed Weeks give you the chance to meet professionals in a range of exciting sectors such as Charities & NGOs and International Development. Thinking of undertaking an internship in the EU this summer? Perhaps you’re looking for an opportunity or you’ve already secured one. Either way, you may be eligible to receive the Erasmus+ Traineeship Grant to help you with the costs associated with interning outside of the UK. The internship was not compulsory to my degree programme – it was fully up to me to decide where to apply. Sourcing the internship was more straightforward than I initially expected. I knew roughly what I wanted to do and what expectations I had and so I just started searching online. I quickly found a couple of research institutes that raised my interest and then proceeded to search for individual research groups. When I found the website of the laboratory I eventually worked with, I knew their work would be right for me – so I just contacted them and was lucky enough to receive a positive reply! My internship took place in a research laboratory which is focussed on gene therapy. I was able to get involved in several ongoing projects, which was a really valuable aspect of my experience. One of the projects hadn’t yet reached the experimental stage and I was able to contribute to planning it from the very beginning. This involved reading many research papers on the topic and coming up with an overall project objective. This experience not only taught me how to be a scientist “behind the scenes”, but also gave me the opportunity to learn experimental procedures within another, larger project. The tasks I completed were typical for a cell and molecular genetics laboratory and involved cloning, Western analysis, qPCR, transfection of mammalian cells and even iPSC development. The country in which my internship took place was not new to me – however, given the international background of the research institute I worked with, I came into contact with many different cultures at once. My co-workers and I often found ourselves discussing differences between languages, cuisines and even day-to-day habits. This not only taught me to look at things from a different perspective but was also a lot of fun! What skills did you develop during the internship? Naturally, working in a research laboratory for two months taught me a lot of experimental techniques relevant to my field of study, as well as the process of planning an advanced research project. However, I learnt so much more than that. During the internship, I wrote a scientific report on all of my accomplishments during the time – this was a really valuable experience and improved my scientific writing skills. On top of that, I believe that working with a variety of people in the laboratory really boosted my communication and teamwork skills, as well as critical thinking and problem-solving skills. Has the experience influenced your plans for the future? The whole internship experience strengthened my desire to pursue a career path in this industry by giving me a much better impression on what this type of work actually involves. I feel like I am more prepared for life after university now and it all seems much less scary! What tips do you have for other students thinking of doing an internship overseas? My main tip for students considering going overseas would be: be open to everything. Your experience will (most) likely not be precisely what you imagined and it would be pretty boring if it were, right? You will learn so many things and gather valuable experience – for your studies, your career and your personal development. Another tip I would give to virtually anyone with high career aspirations is: do not be afraid to dream big! You will only have a chance to succeed if you are unafraid to try so do not let anyone, including yourself, tells you what you cannot do! You don’t need to be doing an internship in a research institute to receive the Erasmus+ Traineeship Grant – all sectors are eligible! If you’d like to apply for the grant, have a look at the Funding page on the Global Internships Programme website to find out more. First of all, what does BAFTA (British Academy of Film and Television Arts) do? Our mission is to bring the very best work in film, games and television to public attention, and support the growth of creative talent in the UK and internationally. We do this by identifying and celebrating excellence, discovering, inspiring and nurturing new talent, and enabling learning and creative collaboration. In addition to our Awards ceremonies, we have a year-round programme of learning events and initiatives that offers unique access to some of the world’s most inspiring talent through workshops, masterclasses, scholarships, lectures and mentoring schemes. The UK boasts a wealth of talented people who could make a huge contribution to the continued excellence of British film, games and television. We want to ensure that this talent is nurtured and supported, so that talented individuals have the opportunity to succeed whatever their background, and – through accessing the expertise of their peers and established practitioners – reach their full potential. And what do you do at BAFTA? At BAFTA I work within the Learning and New Talent team who work with practitioners from the television, film and games community to discuss and define creative excellence in order to share the tools with wider audiences to make better film, games and television. I manage and programme our television industry activity which ranges from industry focused debates and lectures addressing issues of the day, to craft-led masterclasses, panel events, Q&As, exclusive screenings and new talent initiatives. The aim is to share insights and expertise into the craft of programme making from BAFTA winners, nominees and the best minds in TV with a wider audience to develop knowledge, skills and talent. I also nurture BAFTA’s relationships with industry practitioners to ensure we are reflecting and supporting the work of the television industry, as well as working on our new talent initiatives which aim to discover, nurture and support the skills and development of the next generation of talent. I studied media and cultural studies at Nottingham Trent University graduating in 2001, during which I did lots of work experience in media-related environments such as hospital radio and being a production runner for shows such as Big Brother. I also thought it would be useful to build up my administration/office skills, so I also pursued part-time work that would get these skills up to scratch. After I graduated, I moved to London and got a job as a runner in post-production then secured my first media job working for a company that programmed the in-flight entertainment for airlines. However, I knew that I wanted to work in television, so I applied for a role at Carlton TV (now ITV) working with a producer as an administration assistant – so putting those admin/office skills to good use! Then I moved on to Channel 4 as a commissioning assistant before joining BAFTA as a regional programmer, which eventually led into my current role (after a short stint working on the Edinburgh International Television Festival). BAFTA rewards excellence in screen arts, and I love having the opportunity to not only work with practitioners at the top of their game but also supporting talent and skills development in TV, especially at a time where the industry is working so hard to try and level the playing field for anyone from any background or experience to be part of it. What are the current challenges facing this sector? The television workforce is not as representative of society in general as it could be. There has been a recent focus on diversifying the workforce and levelling the playing field across the sector in technical, production and editorial roles – so there are lots more opportunities around than there used to be not only to get into the industry but also to sustain a career. With recent “Digital Disrupters” (as they are referred to in the business) such as online streaming services like Netflix, Amazon and Facebook, the challenge is to make shows that appeal to younger people. There is an eagerness to find stories that will engage and be relevant for this demographic. What are common graduate routes into the industry? As an industry we have many routes in but for graduates there are training schemes and apprenticeships – you can find out about some of these via ScreenSkills the industry-led skills body for the UK’s screen-based creative industries. All broadcasters like BBC, ITV, Channel 4, Sky and Channel 5 advertise their opportunities online, and places like the Unit List and Talent Manager promote jobs. However, you can also get in via junior roles such as runners, researchers or production assistants. Everyone has their own routes. What would be your top tips for getting into this industry? Build your network! As much as possible in your own relevant area of interest. This should include peer-to-peer relationships, as these may be your future collaborators. Make content – e.g. short films, interview led pieces – as this shows passion and your creative eye. Think about your own unique selling points – e.g. if you have an interest in cooking or medieval art or can speak Italian then hone that knowledge, be passionate – this knowledge will come into use. Be flexible if you can – it is largely a freelance industry. See everything as an opportunity. Although London has been traditionally been the place to be, content hubs are expanding and growing all over the UK in places like Salford, Bristol, Leeds and Glasgow. These will be great places to start your career and build up your skills. Think outside of editorial roles, and into craft areas where there are particular skills gaps such as visual effects or editing. E.g. 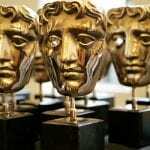 see BAFTA’s Television Craft Awards for a range of potential roles. Check our BAFTA Guru for insights from industry professionals at. Be you – that’s the best quality you have. This blog was written as a follow up to our Media Themed Week. Find out more about upcoming Themed Week events on our website.